On a Plumi site you need permission to edit content. You automatically have permission to edit any content that you have personally added and you can share ownership of content using the Sharing tab to give others permission to edit or view the content also. More information on this can be found in the Sharing Content chapter. 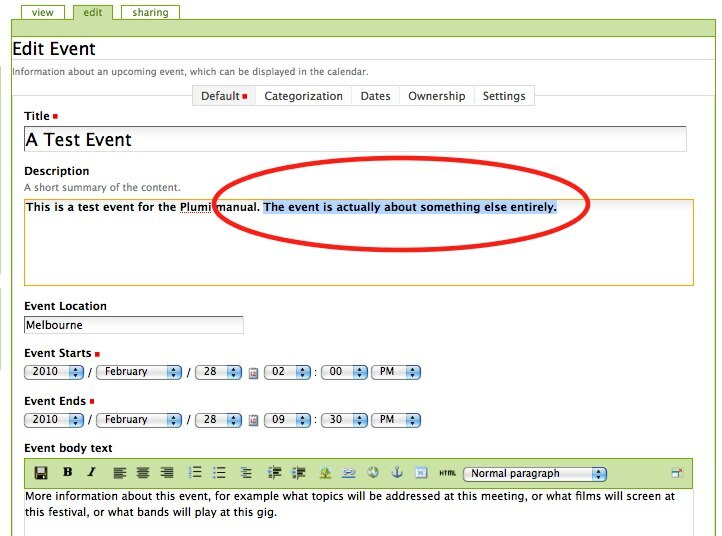 If you are a site Manager, you have permission to edit any content added by any user. 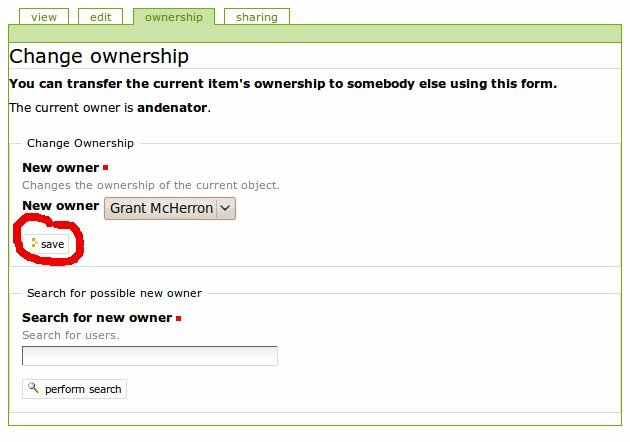 You can also change the owner of an item (see the end of this page for details). Publication Workflow - Is My Content Published? Plumi uses what is called a "work-flow" for the publishing of content. It means that members of the site create content and submit it for publishing, and editors of the site then review that content and approve it or reject it on the basis of the site's editorial policy. Once you've submitted content for publishing it goes into a work-flow state of "pending" - so site editors know that it is pending review. At this point the content is no longer editable by the member who created it - the "creator". The content remains unable to be edited when it is actually published. Now this makes good sense - if content was editable after being submitted for publishing then the original creator could change the content into something inappropriate, for example it could be a way for spammers to get advertising onto the website. However it means that as a content creator, you need to know how to retract your video once you have submitted it for publishing ("pending") or it is actually published ("published"). More info can be found in the Publication States chapter, but we cover the basics of what to do to retract your content, so you can edit it, in the section below. This section explains how to edit a video, news item, callout, event or other content after you have added it, or submitted it for publishing. 1. Navigate to the content you wish to edit. 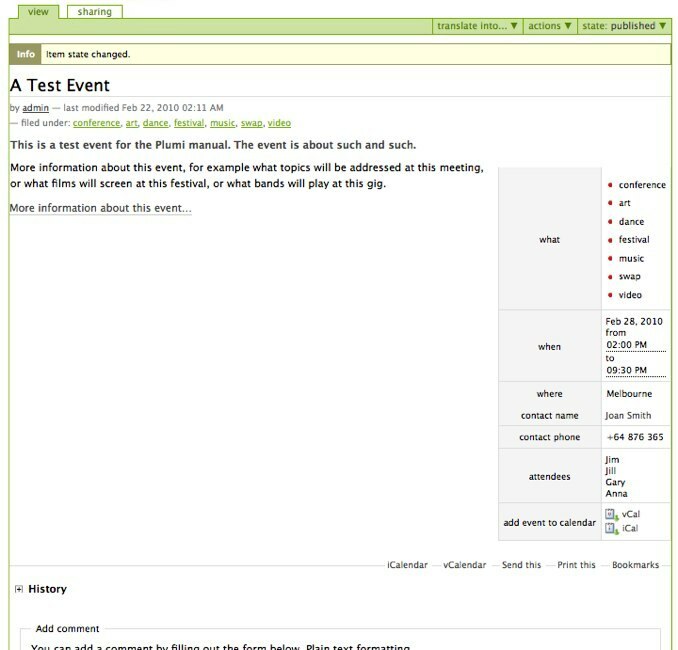 We will use an event as an example. 4. Click the drop-down menu that says pending if the content has not yet been approved, or published if it has already been approved. 5. 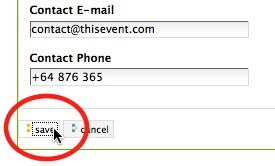 Choose retract from this drop-down menu. 6. Click the Edit tab that now appears, as your content is in public-draft state (this means it is available on the web, but does not come up in listings such as Latest Videos). 7. Edit your content as you wish. 8. Save your content by clicking the Save button. 9. Submit for publishing once again by clicking Submit for publication from the drop-down menu (videos are submitted automatically each time you save them) by clicking. 10. The item will once more be in the pending review state, waiting for review and approval by content editors (note you cannot see the Edit tab anymore). When logged in as a manager, it is possible to change the owner of a piece of content. This is done via the "Ownership" tab. Once in the Ownership tab, you can enter the name of the new owner and then click on the Perform Search button. This will return a drop down box with a list of all the users who match your search value. Select the one you want and then click the Save button. Once completed, you will be returned to the content item's display and a confirmation message will be shown.